After a fun and busy weekend, I wish I could stay home with these two this week! It hasn’t been easy to get back into work mode and healthy eating after the Easter weekend, especially with work stress and the massive amounts of leftover Easter candy people have been bringing into work. There are unopened packages of Peeps everywhere, does anyone actually like eating those? I haven’t been too creative in the kitchen either, lots of smoothies and salads this week – healthy comfort staples for me. But I did feel inspired to create a new dressing today. I usually just flip through the food section in the paper because most of the recipes are complicated and not easily vegan-ized, but a creamy lemon yogurt dip caught my eye today. It was paired it lamb kabobs, no thank you. So I created a lighter dressing version of it for a simple spinach salad that came out great for a few simple ingredients. 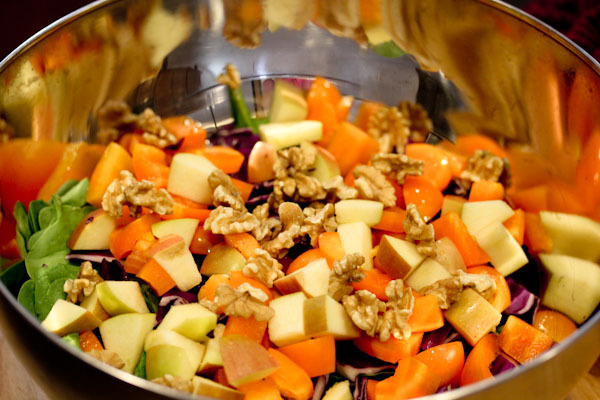 The salad was a mesh of what fresh ingredients I have left in the house – spinach, cabbage, chopped apple, orange pepper, and walnuts. I liked that it’s not super thick, but still coated the salad evenly. The flavor is very bright, tangy, and a little kicky from the garlic. The flavor is strong, perfect for livening up a dull salad or even a hearty meal salad. And my plate cleaning service agreed. Thank you for such a sweet comment! :-) I have a soft spot for rescued pets and would adopt many more if I had the room! It’s tough on a busy schedule to eat healthy, I’m usually making huge salads to eat servings from for quick meals with different dressings and toppings to mix it up. Thanks, he’s such a sweetie! :-) And thanks on the dressing, it came out really good for being so simple. Thanks! :-) Agreed on bananas, I buy them in bulk! Hi – I’ve been subscribed to your Raw Project email updates and am always anxious to read up on your posts! Thanks for continuing to deliver sweet ‘electronic’ inspiration to us all! 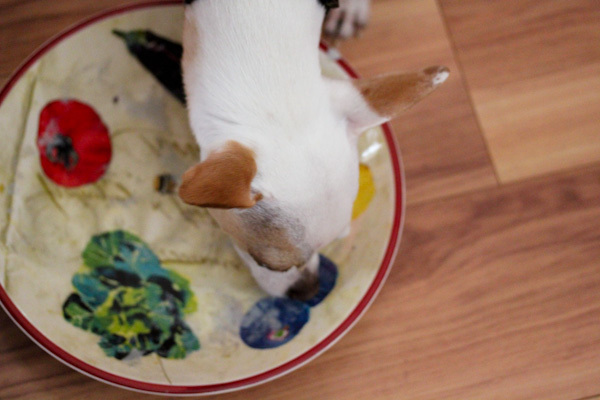 PS: I had a mild panic attack when I read about your ‘plate cleaning service’ – isn’t garlic hazardous to a pup’s health? Thanks for the sweet comment! :-) And for the garlic concern. From everything I’ve read, garlic is safe for dogs in small amounts and it’s even in a lot of dog foods. In larger amounts, garlic can cause gastrointestinal problems. But it’s a concern since there is a lot of conflicting information on it. How am I just now learning about your blog??? This is wonderful! 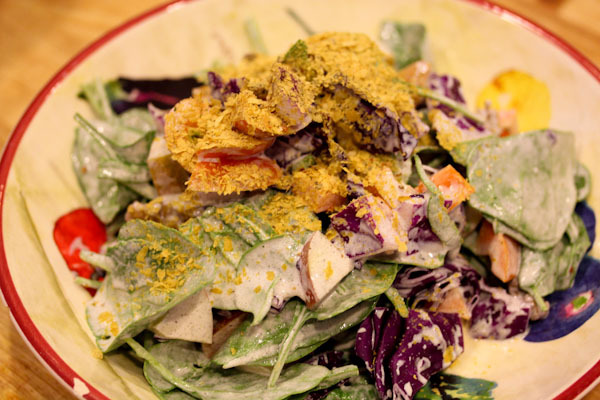 I’d love to have you share your raw goodness at Raw Foods Thursdays. 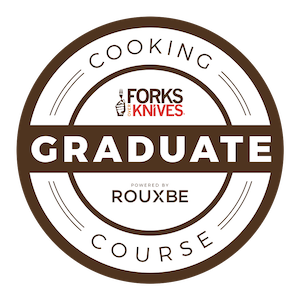 We’d love to learn from you on your journey! 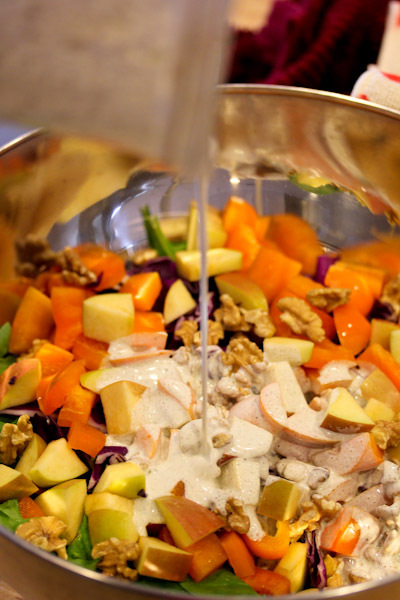 Come link up this dressing recipe! I am an animal lover and love that sweet doggie picture!! Too cute! Thanks and I’m excited about your blog too!